The detailed service records of 250,000 medieval soldiers - including archers who served with Henry V at the Battle of Agincourt - have gone online. The database of those who fought in the Hundred Years War reveals salaries, sickness records and who was knighted. The full profiles of soldiers from 1369 to 1453 will allow researchers to piece together details of their lives. Thomas, Lord Despenser is the youngest soldier on the database, whose career began when he was aged just 12 in 1385. 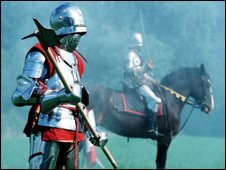 Elsewhere, the career of Thomas Gloucestre, who fought at Agincourt, can be traced over 43 years and includes campaigns in Prussia and Jerusalem. Dr Bell said: "The service records survive because the English exchequer had a very modern obsession with wanting to be sure that the government's money was being spent as intended. "Therefore we have the remarkable survival of indentures for service detailing the forces to be raised, muster rolls showing this service and naming every soldier from duke to archer." He said accounts from captains showing how funds were spent and entries detailing when the exchequer requested the payments can be found. The free-to-use website, funded by the Arts and Humanities Research Council, also shows which soldiers rode the furthest.